Much like Nebo Terrace, the Cursed Lands is filled with undead creatures. Normally I do not mind what an area is filled with, but undead emit an unholy aura that sickens the living. As you have probably already noticed, prolonged exposure to undead causes humans to go into a zombie-like trance. If you don’t believe me, try going to Bergen Hotsprings and observe the sometimes hundreds of monks running in and out of that port, with only killing on their mind! Some people call them “farmers”, because they “farm” enemies for money. However I do not agree with this lighthearted term! Their very souls have been corrupted and they only live to kill! *sigh* What a cruel fate. 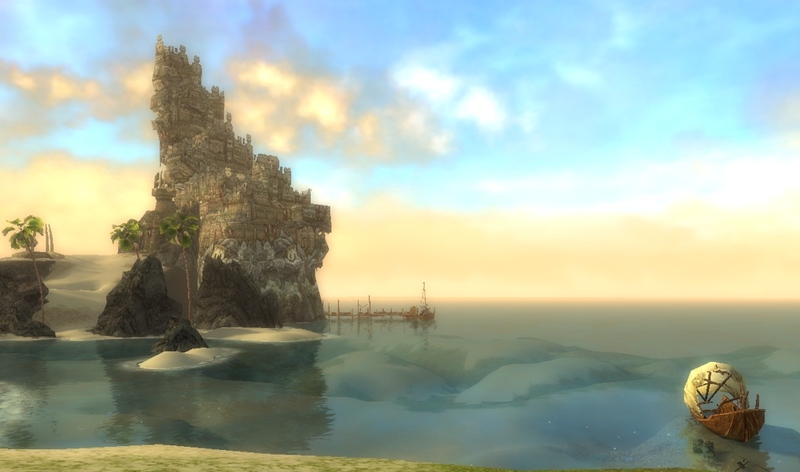 It’s a beautiful day in Kryta, unfortunately no one was able to tag along on this expedition of Watchtower Coast. The beaches here are some of the most beautiful I’ve seen since Shing Jea Island. But due to high monster activity, not a lot of people come this way. I’m not even entirely sure if people live in the tower-complexes here. My good friend Adi The Bloody, decided to help me with today’s exploration of Nebo Terrace! We left from Bergen Hot Springs (which oddly enough a lot of monks seemed to leave from as well.) In the following pictures, you’ll also notice that we have a Gaki. He was imprisoned in a ‘summoning stone’, a fantastic magical innovation! I highly recommend stocking up on a few summoning stones before venturing out into an area. Anyways, Nebo Terrace gets it name from the village of Nebo (located to the north) and the many terraces in the area. It would be quite a lovely area, if it were not for all the undead, tengu, ettins, mergoyles, imps and skales! I’ve finally made my way to North Kryta Province, a large explorable area just outside Lion’s Arch (and D’Alessio Seaboard). For anyone interested in sight-seeing, I would recommend setting aside a fair amount of time to ‘take in’ the beauty of this area. From my own experience and research I’ve done, the monsters are not hard to defeat, but there is a lot of ground to cover. Anyways, our journey beings a few steps outside Lion’s Arch. In the background you can see a huge structure just beyond the waterfall. 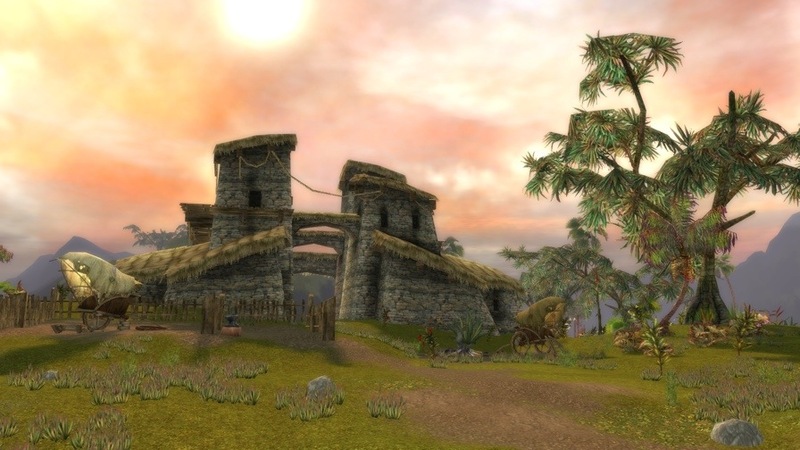 It is an enormous housing complex, perhaps where Krytan elite live and where royalty used to. If you go into Lion’s Arch, there is another similar structure to the south that you can get a good look at as well.